Ballaghtobin House is an exceptionally pleasant old Georgian house with lovely grounds providing friendly B&B accommodation on a working farm run by the charming Mickey and Catherine Gabbett. The Ballaghtobin Estate was named for the Tobins, descendants of the St Aubin Barons of Compsey who became notorious highwaymen, and on hearing of Cromwell‘s advance reputedly hid their ill-gotten treasures in a local well that has never been found since. Acquired in the mid-C16th by one Captain Baker, the property has been passed down through generations of the same family (twice on the female line) to the current owner, whose father Robin inherited it in 1924 at the age of 12 from his famous tennis-player uncle Chaloner Knox. The grounds, covered with daffodils in spring, include a ruined Norman church with an interesting graveyard, a C17th dovecote, kennels designed for Irish wolfhounds, an old walled garden, mature trees and lawns, a hard tennis court, croquet and clock golf facilities, and extensive farmland and forestry where plenty of wildlife can be observed. Callan (Callainn) (pop.1500) is a friendly old market town on the Kings River / Abhainn Rí, supposedly named after Niall Caille, a High King who according to legend was drowned in 844 AD while attempting to rescue a servant during a battle with the Danes. Callan’s main streets were elegantly laid out in the C18th, and feature several handsome Georgian houses, attractive shopfronts and some good pubs and eateries. 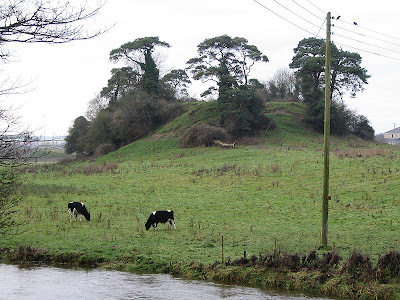 The Seneschal of Leinster,William Marshal, Earl of Pembroke, built a castle around which grew a heavily fortified mediaeval settlement, which received its first charter in 1207, 1217 or 1271. The village passed to the Butlers of Ormond in 1391, and soon became on of the most prosperous population centres in their domain. The Battle of Callan (not to be confused with the 1261 battle of the same name in County Kerry) took place nearby c.1405 between an army led by Taig O’Carroll, The O’Carroll of Ossory and Crown forces under his brother-in-law, King Henry IV‘s Lord Deputy James Butler, 3rd Earl of Ormond, the “White Earl”, who was the eventual victor after major casualties were sustained on both sides. Cromwellian troops attacked Callan in 1650, capturing the town after fierce fighting, including bombardment of the medieval castle and fortifications, with great loss of life. 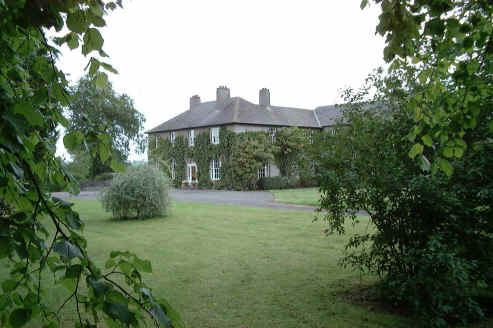 Callan was bought in 1735 by John Cuffe, 1st Baron Desart, whose son, known to contemporaries as Seán an Chaipín, sold most of the local property in 1765 to James Agar, MP for Kilkenny (killed four years later by the great Parliamentary orator Henry Flood in a duel at Dunmore Cave). His son George Agar became MP for Callan in 1777 and 1st Baron Callan in 1790, but the title died with him in 1815. The C19th saw great poverty and suffering in the Callan district. Over 3500 people died in the local Workhouse during the Great Famine and its immediate aftermath. In 1849 the renowned ‘Callan Curates’, fathers Tom O’Shea and Matt Keeffe, took on local landlords (notably John Otway O’Connor Cuffe, 3rd Earl of Desart, whose agent’s evictions at Ballingarry caused notorious distress) by founding the Callan Tenant Protection Society, which rapidly developed into a national movement called the Tenant League, a forerunner of the great National Land League of later in the century. During the War of Independence 4 out of the 7 companies in the IRA‘s 7th Battalion came from the Callan area. St Mary’s church (CoI) was founded by Bishop Hugh de Mapilton in 1251. The west tower is all that remains of the original edifice; the nave, chancel and aisles date from 1460, and a chapel was added in 1530. Fine sculptured details adorn the north and south doors. Adam le Blound, the second husband of notorious Kilkenny “witch” Alice Kyteller, is buried in the church grounds. The Augustinian Friary was founded in 1462 by Eamonn MacRisderd Butler, but the existing building were erected by James Butler, 6th Earl of Ormond, who was buried here in 1487. The sedilla in the south wall of the choir is one of the most ornamental of its kind in Ireland. The Abbey Meadow, a place where for centuries local young people used to meet in the evening while collecting the next day’s water supply for their parents, before the town had piped water, is still the location of a Holy Well reputed to have curative powers. The Priory, built by John Rice for a new Augustinian community in 1802, is connected by a bridge to its medieval precursor. It is used now by all sorts of community groups, including an amateur drama society, and houses a child care centre. In the main street stands a Memorial to Edmund Ignatius Rice (1762- 1844), founder of the notorious Christian Brothers. His thatched home, Rice House, aka the Edmund Rice Heritage Centre, Westcourt, is a popular tourist site. The quaint old Market House (c.1825), later used as the Town Hall, now contains a restaurant. Callan Workhouse, opened in 1842 to accommodate up to 600 paupers, held as many as 2000 at a time during the height of the Great Famine and its aftermath; by 1851 more than 1400 people had died inside the complex, and a further 2000 in adjacent sheds used as fever wards. Only the main building survives, and is undergoing conversion into a civic amenity. The parish church of the Assumption (RC), a neo-classical structure completed in 1843 and long known as “the Big Chapel”, features some rich stucco work. Amhlaoibh Ó Súilleabháin (1780-1838) was a local schoolmaster and linen-draper, whose Irish language diary recorded the life of the town he called Callain an Chlampair – “Callan of the Ructions” in great detail between 1827 and 1835, a time of extreme poverty. Other famous natives of Callan include James Hoban (b.1762), architect of the White House in Washington DC; Fenian poet and journalist John Locke (1847 – 1889); the emigrant ancestors of Coca-Cola tycoon Asa Griggs Candler (1851 – 1929), artist Tony O’Malley and novelist / playwright Tom Kilroy. Neil Jordan filmed many of the scenes for his movie of Patrick McCabe‘s novel Breakfast on Pluto in Callan in 2004. Callan is also a fairly common surname, presumably borne by the founder of the eccentric Callan Method of Teaching English as a Foreign Language, which apparently requires teachers to speak much faster than usual. Callan is connected by a very scenic stretch of the N76 to Killamery on ByRoute 3.